a lovely little life: Home Ec. The garden is coming along nicely these days... we've been harvesting a bunch of the lettuces for dinner salads and I cut a bunch of the rainbow chard to make a couple of quiches the other night. I planted the basil seedlings a few weeks ago and those are slowly growing, too slowly for my liking. I like using the bolted basil in little vases to make the house smell good so I want them to get huge. Our carrot tops are getting nice and fluffy but I'm scared to pull them. I want big carrots! So disappointing when you pull a carrot and it's like a vienna weiner. They're the heirloom variety too and are supposed to be a really dark red. Pretty! Our jalapenos and pattypan squashes are making progress too, but nothing to harvest from them yet. I think when my dad comes to visit next, we're going to pull up all the ice plant around Linus the Lemon Tree and put in another raised bed so we can grow even more. I'm a farmer. In the crafts department, I've been sewing a few things. I forgot to take a picture of the little zippy clutch I made Lynne for her birthday, and Sue's Mommy's day gift turned out a little wonky so I have to rip out the zipper and re-sew that one. No pictures of my mistakes on the blog. Only nice end products so you all think I'm a great sewer. Here's my mom's new purse, to replace the old one she's worn into the ground. It's the same pattern as her last one (from Lotta's book) but we tweaked it a bit to make it more functional for my mom. She doesn't like the sideways front pocket on the original pattern so I added a second gold pocket on the front side because those are handy for keeping the phone and pens etc. I used the new Cloud 9 fabric for the outside and pockets, a pretty turquoise wide wale corduroy for the lining (from JoAnn's), and my favorite gold pleather for the pockets (also from JoAnn's). 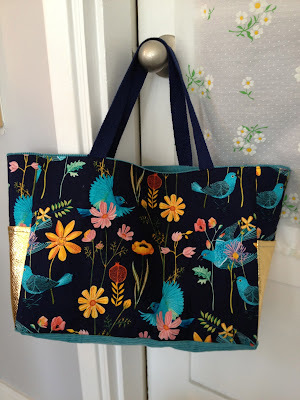 The Cloud 9 fabric is a little flimsy for a purse like this (it's a normal quilting weight cotton) so I lined it with interfacing to make it more sturdy. Ta-da! I did screw up one part though and I'm pissed about it. One of the handles is twisted one turn more so they don't hang perfectly. D'oh! It's one of those mistakes though that isn't really worth fixing. I'll let my mom carry it for the next few days and will fix it before she leaves if it bothers her. We stopped at a garage sale on the way home from Trader Joe's the other day and I found these awesome trims and got all of them for only $5! I need to go to more garage sales. The top one (blue, white and black) is my favorite and it's a huge roll, probably 10 yards. I love the gold greek key one too. Can't wait to use them! 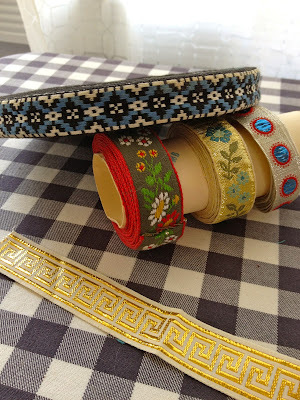 inThose trims look like ones my mom bought to decorate all my homemeade dresses she sewed for me in the early 70's.late 60's. I wonder how old these are?